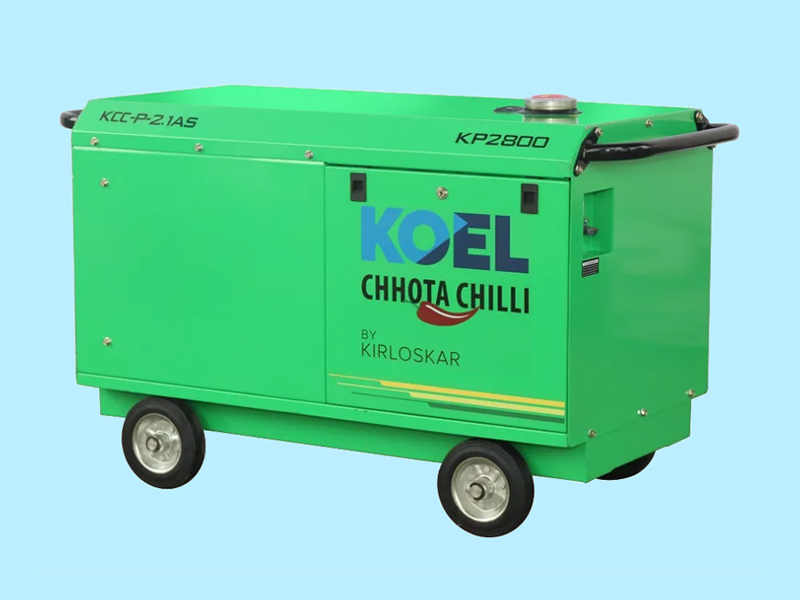 The Kirloskar Chhota Chilli portable diesel genset is brought to you by Kirloskar Oil Engines Ltd - the flagship company of the Kirloskar Group that also manufactures KOEL Green - Indias most preferred brand of gensets. The company manufactures and markets both air - cooled and liquid cooled gensets with outputs from 5kVA to 5200kVA and is an acknowledged leader in the manufacturing of diesel engines, agricultural pump sets and generating sets. KOEL serves segments that includes Service industries such as telecom, IT/ITES, BPO, shopping malls, hotels, hospitals, banks, educational and financial institutions; Infrastructure project such as airport, roads, bridges, residential and commercial complexes, townships, high-rise building, and many more. Other significant industries include engineering, manufacturing, FMCG, automobile and also ancillaries, textile, pharmaceuticals, dairy and food processing and Defense agencies (air force, army, navy and coast guard) It is no wonder that KOEL today has the power to Enrich Lives across the world!